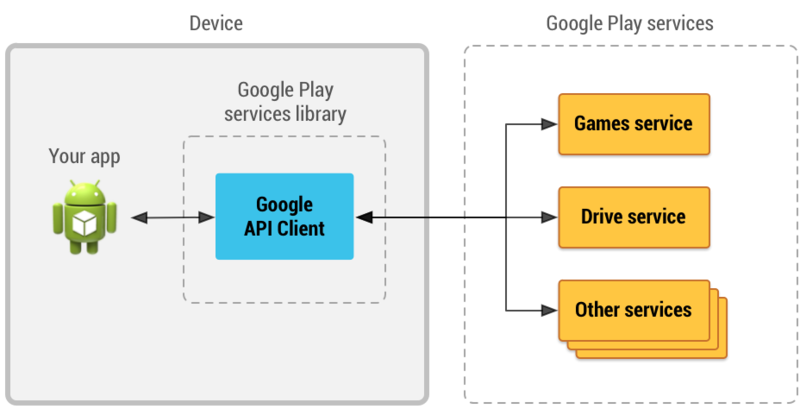 You can use the GoogleApiClient ("Google API Client") object to access the Google APIs provided in the Google Play services library (such as Google Sign-In, Games, and Drive). The Google API Client provides a common entry point to Google Play services and manages the network connection between the user's device and each Google service. However, the newer GoogleApi interface and its implementations are easier to use and are the preferred way to access Play services APIs. See Accessing Google APIs. Note: If the Google API you want to use is not included in the Google Play services library, you can connect using the appropriate REST API, but you must obtain user authorization with OAuth 2.0. For more information, read Authorizing with Google for REST APIs. Automatically manage your connection to Google Play services. Perform synchronous and asynchronous API calls to any of the Google Play services. Manually manage your connection to Google Play services in those rare cases where this is necessary. To learn more, see Manually managed connections. Figure 1: An illustration showing how the Google API Client provides an interface for connecting and making calls to any of the available Google Play services such as Google Play Games and Google Drive. To get started, you must first install the Google Play services library (revision 15 or higher) for your Android SDK. If you haven't done so already, follow the instructions in Set Up Google Play Services SDK. You can add multiple APIs and multiple scopes to the same GoogleApiClient by appending additional calls to addApi() and addScope(). Important: If you are adding the Wearable API together with other APIs to a GoogleApiClient, you may run into client connection errors on devices that do not have the Wear OS app installed. To avoid connection errors, call the addApiIfAvailable() method and pass in the Wearable API to allow your client to gracefully handle the missing API. For more information, see Access the Wearable API. To begin an automatically managed connection, you must specify an implementation for the OnConnectionFailedListener interface to receive unresolvable connection errors. When your auto-managed GoogleApiClient instance attempts to connect to Google APIs, it will automatically display UI to attempt to fix any resolvable connection failures (for example, if Google Play services needs to be updated). If an error occurs that cannot be resolved, you will receive a call to onConnectionFailed(). You may also specify an optional implementation for the ConnectionCallbacks interface if your app needs to know when the automatically managed connection is established or suspended. For example if your app makes calls to write data to Google APIs, these should be invoked only after the onConnected() method has been called. Your GoogleApiClient instance will automatically connect after your activity calls onStart() and disconnect after calling onStop(). Your app can immediately begin making read requests to Google APIs after building GoogleApiClient, without waiting for the connection to complete. After connecting, your client can make read and write calls using the service-specific APIs for which your app is authorized, as specified by the APIs and scopes you added to your GoogleApiClient instance. Note: Before making calls to specific Google services, you may first need to register your app in the Google Developer Console. For instructions, refer to the appropriate getting started guide for the API you're using, such as Google Drive or Google Sign-In. When you perform a read or write request using GoogleApiClient, the API client returns a PendingResult object that represents the request. This occurs immediately, before the request is delivered to the Google service that your app is calling. After your app has a PendingResult object, your app can then specify whether the request is handled as an asynchronous call or as a synchronous call. Tip: Your app can enqueue read requests while not connected to Google Play services. For example, your app can call methods to read a file from Google Drive regardless of whether your GoogleApiClient instance is connected yet. After a connection is established, enqueued read requests execute. Write requests generate an error if your app calls Google Play services write methods while your Google API Client is not connected. // Create a query for a specific filename in Drive. // Success! Handle the query result. When your app receives a Result object in the onResult() callback, it is delivered as an instance of the appropriate subclass as specified by the API you're using, such as DriveApi.MetadataBufferResult. If you want your code to execute in a strictly defined order, perhaps because the result of one call is needed as an argument to another, you can make your request synchronous by calling await() on the PendingResult. This blocks the thread and returns the Result object when the request completes. This object is delivered as an instance of the appropriate subclass as specified by the API you're using, for example DriveApi.MetadataBufferResult. Because calling await() blocks the thread until the result arrives, your app should never make synchronous requests to Google APIs on the UI thread. Your app can create a new thread using an AsyncTask object, and use that thread to make the synchronous request. Note: You can also make your code execute in a strictly defined order using PendingResult.then(). The Wearable API provides a communication channel for apps that run on handheld and wearable devices. The API consists of a set of data objects that the system can send and synchronize, and listeners that notify your apps of important events using a data layer. The Wearable API is available on devices running Android 4.3 (API level 18) or higher when a wearable device is connected and the Wear OS companion app is installed on the device. In situations where the Wearable API is not available, connection requests that include the Wearable API fail with the API_UNAVAILABLE error code. If your app uses the Wearable API in addition to other Google APIs, call the addApiIfAvailable() method and pass in the Wearable API to check whether it is available. You can use this check to help your app to gracefully handle cases where the API is unavailable. If you call addApi() and the GoogleApiClient is unable to connect successfully to that API, the entire connection operation for that client fails and triggers the onConnectionFailed() callback. You can register an API connection failure to be ignored by using addApiIfAvailable(). If an API added with addApiIfAvailable() fails to connect due to a non-recoverable error (like API_UNAVAILABLE for Wear), that API is dropped from your GoogleApiClient and the client proceeds to connect to other APIs. However, if any API connection fails with a recoverable error (like an OAuth consent resolution intent), the client connect operation fails. When using an automatically managed connection the GoogleApiClient will attempt to resolve such errors when possible. When using a manually managed connection a ConnectionResult containing a resolution intent is delivered to the onConnectionFailed() callback. API connection failures are ignored only if there is no resolution for the failure and the API was added with addApiIfAvailable(). To learn how to implement manual connection failure handling, see Handle connection failures. Because APIs added with addApiIfAvailable() may not always be present in the connected GoogleApiClient instance, you should guard calls to these APIs by adding a check using hasConnectedApi(). To find out why a particular API failed to connect when the entire connection operation succeeded for the client, call getConnectionResult() and get the error code from the ConnectionResult object. If your client calls an API when it is not connected to the client, the call fails with the API_NOT_AVAILABLE status code. If the API you are adding through addApiIfAvailable() requires one or more scopes, add those scopes as parameters in your addApiIfAvailable() method call rather than by using the addScope() method. Scopes added using this approach may not be requested if the API connection fails before getting OAuth consent, whereas scopes added with addScope() are always requested. This section provides examples of these and other advanced use cases. To initiate a manually managed connection to GoogleApiClient, you must specify an implementation for the callback interfaces, ConnectionCallbacks and OnConnectionFailedListener. These interfaces receive callbacks in response to the asynchronous connect() method when the connection to Google Play services succeeds, fails, or becomes suspended. When managing a connection manually you will need to call the connect() and disconnect() methods at the right points in your app's lifecycle. In an activity context the best practice is to call connect() in your activity's onStart() method and disconnect() in your activity's onStop() method. The connect() and disconnect() methods are called automatically when using an automatically managed connection. If you are using GoogleApiClient to connect to APIs that require authentication, like Google Drive or Google Play Games, there's a good chance your first connection attempt will fail and your app will receive a call to onConnectionFailed() with the SIGN_IN_REQUIRED error because the user account was not specified. When your app receives a call to the onConnectionFailed() callback, you should call hasResolution() on the provided ConnectionResult object. If it returns true, your app can request that the user take immediate action to resolve the error by calling startResolutionForResult() on the ConnectionResult object. The startResolutionForResult() method behaves the same as startActivityForResult() in this situation, and launches an activity appropriate to the context that helps the user to resolve the error (such as an activity that helps the user to select an account). If hasResolution() returns false, your app should call GoogleApiAvailability.getErrorDialog(), passing the error code to this method. This returns a Dialog provided by Google Play services that's appropriate to the error. The dialog may simply provide a message explaining the error, or it may also provide an action to launch an activity that can resolve the error (such as when the user needs to install a newer version of Google Play services). // Already attempting to resolve an error. // There was an error with the resolution intent. Try again. In the above code, you probably noticed the boolean, mResolvingError. This keeps track of the app state while the user is resolving the error to avoid repetitive attempts to resolve the same error. For example, while the account picker dialog is displayed to help the user to resolve the SIGN_IN_REQUIRED error, the user may rotate the screen. This recreates your activity and causes your onStart() method to be called again, which then calls connect() again. This results in another call to startResolutionForResult(), which creates another account picker dialog in front of the existing one. This boolean serves its intended purpose only if it persists across activity instances. The next section explains how to maintain the error handling state of your app despite other user actions or events that occur on the device. To avoid executing the code in onConnectionFailed() while a previous attempt to resolve an error is in progress, you need to retain a boolean that tracks whether your app is already attempting to resolve an error. As shown in the code example above, your app should set a boolean to true each time it calls startResolutionForResult() or displays the dialog from GoogleApiAvailability.getErrorDialog(). Then, when your app receives RESULT_OK in the onActivityResult() callback, set the boolean to false. Now you're ready to safely run your app and manually connect to Google Play services.